If you sold your house and decided to move, you wouldn’t throw away all of your furniture—you’d move it with you. Yet, many corporations faced with the cost and complexity of dismantling furniture systems and re-installing them choose to discard the furniture as a complete write-oﬀ. You can have your oﬃce furniture refurbished so that it can be reused in the new location, you can sell old furniture to a refurbishing company, or you can meet your growing furniture needs with recycled products. Many facilities managers now realize that they can purchase refurbished or re-manufactured furniture from the same company that buys their used furniture. Doing this not only saves money, but also helps a company meet environmental goals. Many facilities managers are seeing the twin beneﬁts of recycled oﬃce furniture: cost savings and environmental soundness. As a result, the recycled oﬃce furniture business has grown rapidly. 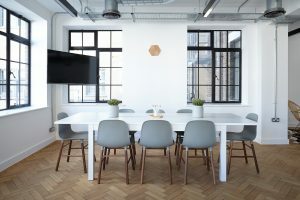 One or more of the following options may be a good choice for you as you plan to furnish your new oﬃce space. Re-manufactured furniture is typically taken apart, cleaned, repaired, and made like new. This is a great option, since you’ll receive a product that is both aﬀordable AND looks brand new. Refurbished goods are not completely dissembled, but they are cleaned, reﬁnished, or otherwise cosmetically enhanced for resale. You can even have your old oﬃce furniture refurbished for your own use, extending its life. Used furniture is typically sold in as-is condition. Often, companies can ﬁnd furnishings that are in practically new condition, making used furniture a great money-saving option. With so many options available, it no longer makes sense to simply discard old furniture because it’s too costly or too complicated to move it. Facilities managers now have a wide range of choices to wring more value out of old furniture. For more information and resources, check out MoveMyBiz – the #1 resource for office relocations!